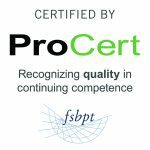 This course has been certified by the FSBPT for Physical Therapy Continuing Education. The FSBPT is recognized as a certifying agency for the following states: Alaska, Arizona, Arkansas, California, Colorado, Delaware, District of Columbia, Georgia, Hawaii, Idaho, Illinois, Indiana, Kansas, Kentucky, Michigan, Minnesota, Mississippi, Missouri, Montana, Nebraska, North Carolina, North Dakota, Oregon, Pennsylvania, Puerto Rico, Rhode Island, South Carolina, South Dakota, Tennessee, Utah, Vermont, Virginia, Wisconsin, and Wyoming. This course has also been approved by the Ohio Physical Therapy Association. Course Description: This course provides an in-depth review of cardiovascular and pulmonary (CVP) anatomy and physiology. Up to date pathophysiology will be discussed for the commonly seen CVP diagnoses. Clinical tips will be assimilated into all course material for direct application to daily patient care experiences. Participants will learn about CVP diagnostic testing including why tests are performed, how to interpret these tests and how to apply results to your interventions. You will acquire treatment approaches for adult CVP patients including primary and secondary prevention for CVD, breathing and airway clearance exercises/techniques and advanced interventions for complex CVP patients. This course also provides a comprehensive study of how CVP outcome measures can be utilized in the rehabilitation setting to assist with case management, discharge recommendations, assessment of deficits, and progression of the treatment plan. Content is based on evidence and is designed to allow direct application to the Practitioner’s clinical practice. integrate inspiratory muscle training into treatment options for failure to wean and COPD patients.